Shin, Dynamic Nonlinear Systems: Theory and Application to Tool Wear Monitoring in Flexible Manufacturing Systems. Wang and Chang, Identification of Surface Flaws in Manufacturing System Products. Snyder, Active Noise and Vibration Control Using a Neural Network-based Controller. Loh, pH Processes. Du, Engineering Monitoring and Diagnosis. Chan, Robotic Assembly in Electronics Manufacturing Systems. Damle and Rao, Smart Structural Systems. Kim and Lewis, Dynamic Neural Networks for Closed-Loop Feedback Control and Estimation of Uncertain Nonlinear Systems. Sen, Hearn, and Zhang, Adaptive Neural Controller. Industrial and Manufacturing Systems serves as an in-depth guide to major applications in this focal area of interest to the engineering community. This volume emphasizes the neural network structures used to achieve practical and effective systems, and provides numerous examples. 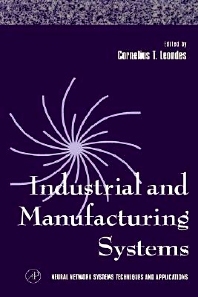 Industrial and Manufacturing Systems is a unique and comprehensive reference to diverse application methodologies and implementations by means of neural network systems. It willbe of use to practitioners, researchers, and students in industrial, manufacturing, electrical, and mechanical engineering, as well as in computer science and engineering. Emphasis is placed on neural network structures for achieving practical and effective systems, with numerous examples illustrating the text; Practitioners, researchers, and students in industrial, manufacturing, electrical, and mechanical engineering, as well as in computer science and engineering, will find this volume a unique and comprehensive reference to diverse application methodologies and implementations by means of neura network systems. Practitioners, research workers, academicians, students, and others in mechanical, electrical, industrial, manufacturing, and production engineering, as well as computer science and engineering.